It’s time to get tiny, naturally! Do you dream of living in a beautiful, practical, ecologically responsible home built by your own hands? Do you yearn for the autonomy of owning a home, but don’t have the budget to buy? 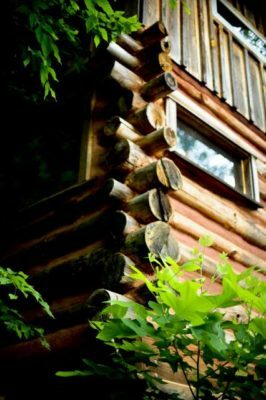 This natural building and tiny house workshop near Asheville, NC will help transform those dreams into reality in 8 days. It’s a crash-course covering the basics and beyond of tiny house design and construction, with an emphasis on ecological considerations and natural building techniques. Learn to build your very own tiny house and use natural materials for beauty and function. Whatever style of learning works best for you, we’ve got you covered. Over the course of eight full days we’ll engage in a healthy balance of theory, application and exploration. This includes lots of hands-on learning. 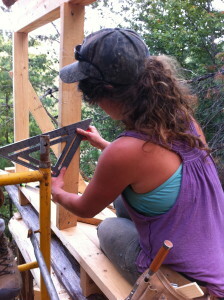 Throughout the workshop we’ll be constructing an actual tiny house from the ground up. It’s for a member of the community, who gets a home at the end! Getting a chance to apply ideas and concepts right away will bring them to life and anchor your learning. Students learn the basics of building through lectures, engaging class discussions, and practical applications. As a result, you’ll leave the class prepared to build your own tiny houses or natural buildings. 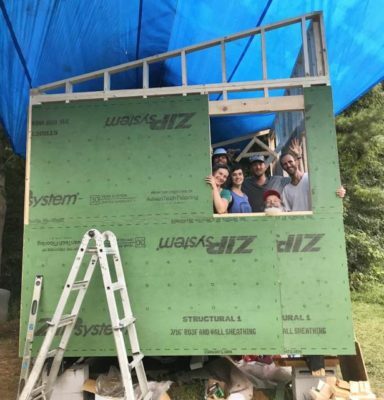 In fact, many past participants have gone on to build tiny homes in Asheville and beyond! Theory and Design: Foundations, walls, roofs, passive solar design, materials sourcing, tiny house plans, oh my! 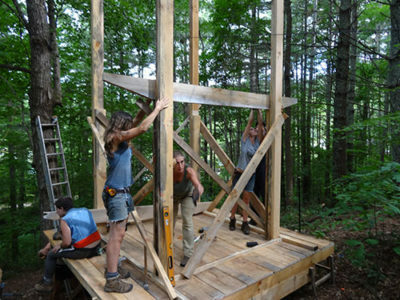 We’ll get started by learning about how buildings stand up (foundations, loads and bracing), floor systems, walls, roof systems, how to choose a building site, passive solar design, working with clay, tiny home plans, and regenerative timber harvesting. Our tiny house workshop will also include discussion of material sourcing and introduce plumbing and electrical specifically for tiny homes. We’ll talk about how to build a tiny house on skids, how to build a tiny houses on a trailer, and other special considerations for movable structures. After learning the theories and concepts, we’ll take a tour of natural buildings in and around Asheville, NC. You’ll get to see a variety of tiny homes, a straw bale house, cob construction, natural buildings and a passive solar design at their finest. It’s Asheville’s own Tiny House Nation! You will have the chance to see, touch and learn about various styles, such as timber framing, log cabin construction, cob, stone masonry, adobe, wattle and daub, earthen floors and bamboo construction. We’ll visit many hybrids of conventional and natural construction. Taking a natural building course doesn’t mean you can only apply what you’ve learned if you build 100% natural. We encourage students to mix and match based on their interests, skill set, and desired outcomes. You can find your own sweet spot! 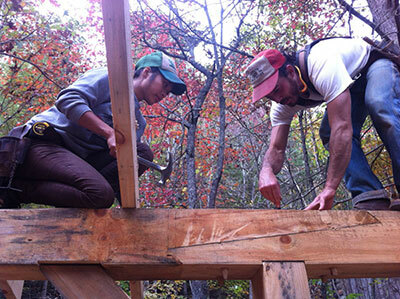 Once the theoretical groundwork is laid, students will learn how to build tiny homes and natural buildings from the ground up. 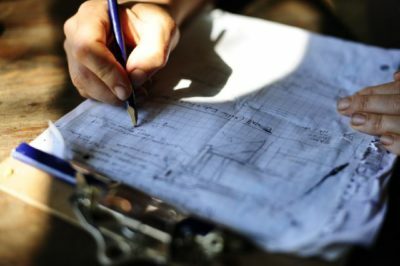 Using hands-on building techniques, you will have an opportunity to practice building and erecting walls, putting on a roof, applying earthen plaster, lime plaster, earthen paint, door and window installation and doing a bit of trim carpentry. In the end, students will experiment with designing their own tiny house floor plans. Everyone will have the opportunity to receive feedback directly from instructors and fellow students. When you leave this tiny house workshop we want you to feel ready to get started on your own tiny home! We also offer an intensive Permaculture Design Course that is 12 consecutive days. Foraging for food and medicine, friction fire, natural building, community dynamics and communication, whole-systems thinking, preparing for catastrophe, human nutrition, water management, homestead economics, and much more. The Earth Skills and Permaculture Immersion Course grew out of our “Essentials” course. We’ve added a whole day of instruction each month, plus some amazing new guest instructors (see below). 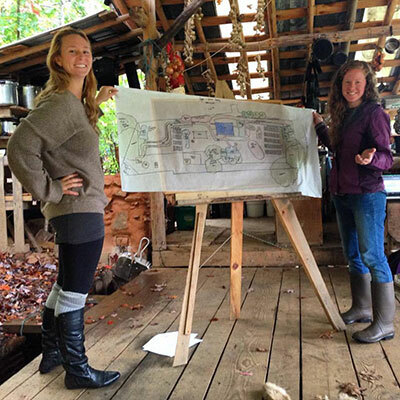 Not to mention, the class now lets you earn your permaculture design certificate. Students will delve deeply into the content, integrating what they learn into their lives. To do this, we meet for one three-day weekend intensive per month. Each weekend has a theme and covers a group of topics and skills. Throughout the course, students will work on a permaculture design project in small groups. This is one of the requirements of permaculture certification. In addition, it gives students a chance to integrate and engage with the nine months of learning, observing and reflecting. Class time is a dynamic mix of hands-on projects, site visits to observe principles in practice, group discussion, lecture and supported design time. Special Note: If you are unable to attend one or two weekends, not to worry! There will be opportunities for you to make-up classes by attending other Wild Abundance classes, self-study or attending the classes you missed next year. We’re lucky to live in a hotbed of modern day back-to-the-landers and homesteaders. In fact, there are many folks around here living with ingenuity and creativity as they apply permaculture principles into their lives. Asheville is known as a hub for organic gardening, natural building, intentional community development, earthskills, and permaculture. Our instructors are some of the area’s finest in their fields. 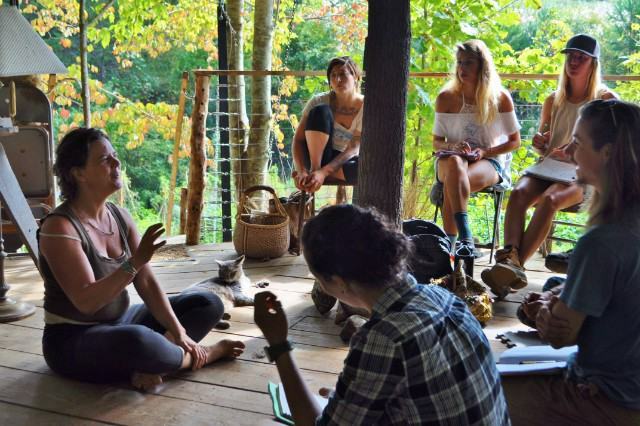 They teach their specialties and passions, infusing this permaculture design course with a wealth of experience, inspiration and engaging teaching styles. Eric Toensmeier, award-winning author, Yale lecturer, international trainer, and best of all, brilliant permaculturist. He’s got two decades of practical and theoretical experience and is a perennial vegetable and carbon farming expert. Eric will help us learn to survive and thrive in the face of global climate change. 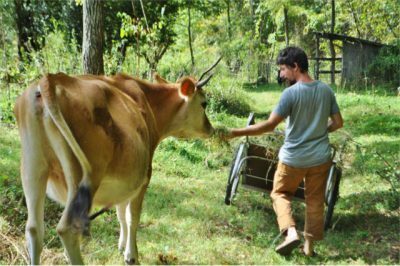 Ben Falk lives permaculture every day at his Vermont homestead. It’s a testing-ground for ideas and projects that he shares with the wider world through teaching, consulting, and writing. He’s the author of the award-winning book “The Resilient Farm and Homestead.” This guy walks his talk! See more about individual instructors at the bottom of this page. 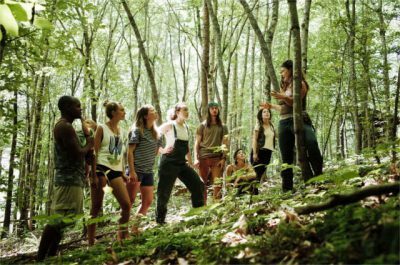 Backpacking trip covering: identification and uses of wild edible plants, medicinal plants, botany, foraging edible weeds and wild foods cookery. The forest (and our team of naturalists and botanists) will introduce us to plant guilds, holistic forestry, climates, biogeography, microclimates and reading the landscape. 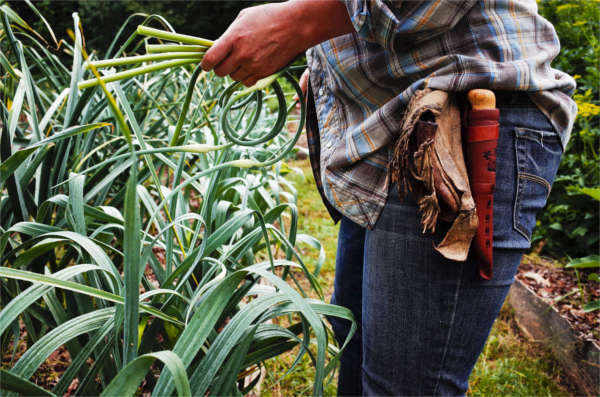 Fire-by-friction and friction fire kits to take home, early spring gardening and garden planning, seed starting, permaculture principles, leather knife sheath making, and more. 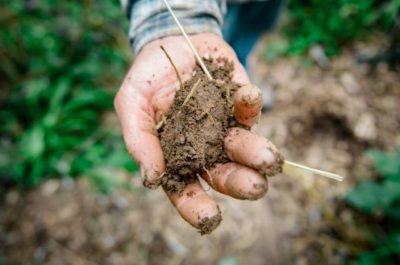 We’ll review the process for getting your permaculture certification and get started on design projects. 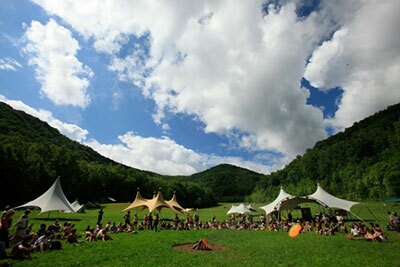 Earthskills and Permaculture Immersion students will get a free three day weekend pass to the Firefly Gathering. 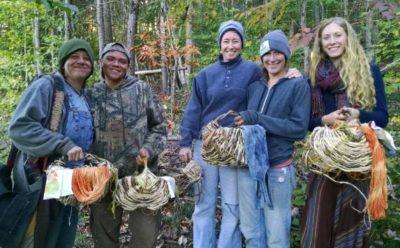 It’s the largest primitive skills gathering in the US and hosts dozens of classes on permaculture, eco-homesteading, and primitive skills. Think of this as time to explore electives. In the past the Earthskills group has camped together and shared some of their meals, creating their own supportive community within the bigger container of the gathering. 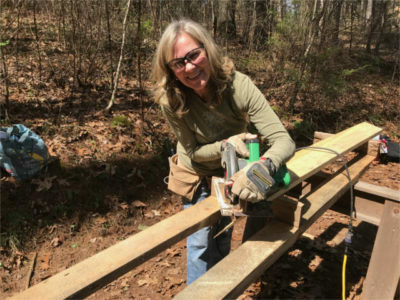 During the Tiny House and Natural Building workshop, we’ll take a tour of local homesteads, have an overview of natural building, and do some hands-on natural building and carpentry projects. Students can choose to attend just for the 3-day weekend, or can add the rest of the workshop for a reduced fee. We will kick off the weekend with preliminary design presentations. 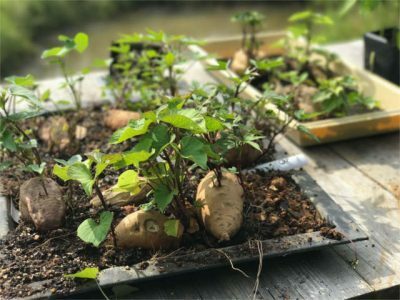 Designing professionally, urban farm tour, playing with pasture management and larger-scale gardening, holistic orcharding, permaculture plants for the south, fall gardening, working on hands-on permaculture designs, food preservation. Social Permaculture, tools of the homestead, facilitated design time, ecovillage and neighborhood design, and preparing for catastrophe. 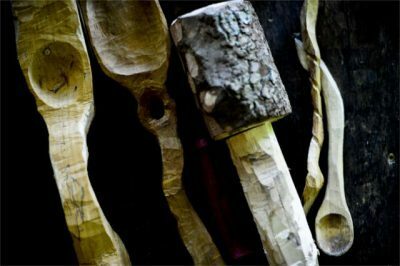 You’ll also learn how to carve spoons, and you’ll get to make a beauty to take home. Final permaculture design presentations, human nutrition, tools of the homestead, deep ecology, harvesting materials for baskets, starting baskets, introduction to using chainsaws, introduction to hunting, stalking, and flintknapping. Focus on figuring out where to go from here. We will look at gifts and abilities, and help each other find our paths and identify any obstacles standing in the way. We’ll also finish our beautiful baskets, and learn seed saving and fruit tree pruning. Learn to design and build your own buildings from the ground up! 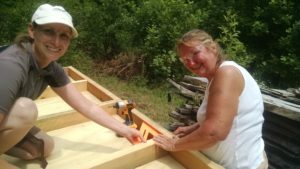 We have had such awesome experiences with our Women’s Basic Carpentry Class, that we have decided to offer something to take students to the next level. 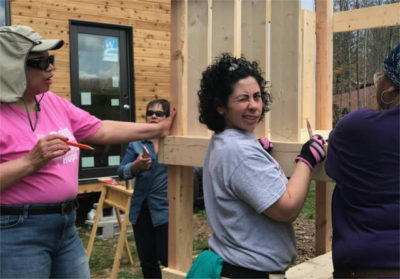 While the Women’s Basic Carpentry Class teaches students how to use tools and gives them projects to help them get that knowledge in their bodies, the Advanced Women’s Carpentry Class focuses on empowering women to design and build buildings from the ground up. Please note that our Advanced Women’s Carpentry Class is only available to those who have already taken the Women’s Basic Carpentry Class. We will be running several sessions this year, including: April 4-7(FULL), April 18-21(FULL), July 11-4, and August 8-11. We will introduce students to many types of possible foundations, including slab on grade, rubble trench, block, stone, and post. Students will learn about laying out a building square using batter boards, and will work on either pouring (a) concrete footer(s), or installing a floor. Students will learn about the distinctions, advantages, and disadvantages of various wooden-framed wall systems, including timber frame, post and beam, and “stick-framed,” or “stud” (referring to a vertical board, not a male identified person who likes to strut around) walls. We will explore different siding and paneling options. After learning about and getting their eyes and hands all over various systems, students will work on a real-live wall, and learn how to build, erect, side, insulate, and panel one. The morning talk this day will focus on various roof shapes, framing systems and the advantages and disadvantages of various roofing materials. We will work, again, on a real live roof. Day 4: The Finishing Touches: Windows, Doors, and Trim, Oh My! We will work on filling in the rough openings made on the wall day with windows, maybe install a door, and, depending on how the class has gone, we might even delve into the complex and rewarding world of stairs. The priority during this class is not progress on buildings, but rather the depth of learning of the students. We put a lot of effort into making sure that there will be building projects at various phases in order for students to learn about the different parts of a building. 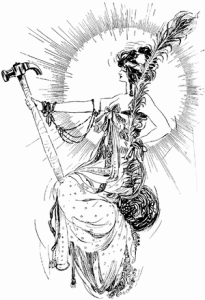 Depending on the comfortable pace of the class and the whims of the building goddesses (or god, depending on your spiritual leanings), some of the specific projects might change. We will work hard to assure a balance in the depth that students go in a particular project, and the breadth that the students explore on different projects to assure that students learning environment feels safe and healthy, and that we are not left with too many messes at the end of the class. We’re offering a few class sessions this year. Students only need to attend one of these sets of dates. If none of them work for you, but you’d like to attend, let us know and we’ll put you on our waitlist. Lets face it. In this culture, it’s much more likely for male-bodied people to be more comfortable with tools and carpentry than female-bodied people. 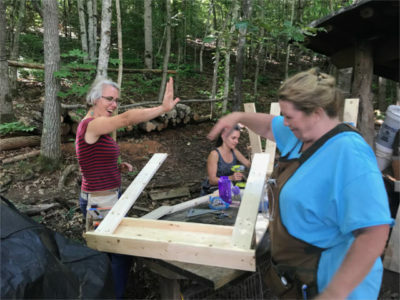 Year after year during our natural building class, we received feedback from women that it would be super-helpful to have a class specifically geared towards getting women acquainted with tools and basic carpentry. Our bodies are different, our backgrounds are likely different, and so we need a class just for ourselves! 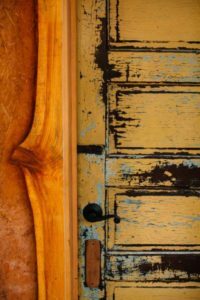 This class is intended to get ladies up-to-speed on basic building skills, working with wood, and using hand-tools as well as power-tools. Focus is placed on creating a safe, comfortable, relaxed and fun learning environment in which students with beginning to intermediate skill levels can thrive. We focus on helping each student learn rather than the progression of projects. This beginner class involves lots of work with tools and smaller projects. 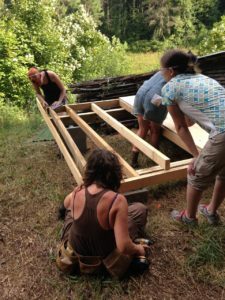 For those who are interested in larger projects, especially structural building, we offer an Advanced Women’s Carpentry Class. 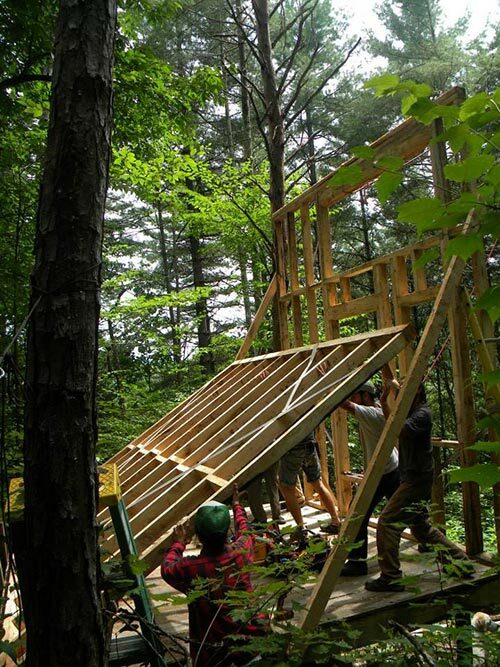 In addition, we’ve got a fantastic Natural Building and Tiny House Workshop. Anyone who has completed the basic carpentry class will be well prepared for either the advanced class or tiny house workshop. Ladies, prepare to tame those mythical beasts (power tools) and make them part of your building repertoire. 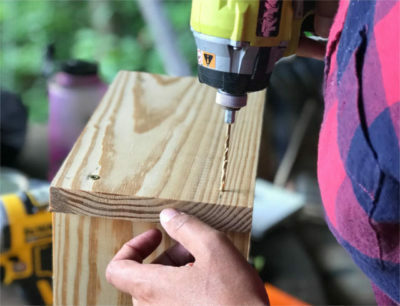 During this four-day workshop, we will cover basic carpentry skills and the fundamentals of choosing and using the right tools for different jobs, as well as the maintenance of everything needed to complete a carpentry project. And you can expect this wealth of information to be tailored specifically for women and women’s bodies. Note: Participants who are camping are encouraged (but not required) to arrive on the evening before class starts to get settled in. Day 1: Tools, Tools, Tools & Women’s Empowerment! Our theme of the day is women’s empowerment and helping you learn the essentials of a basic carpentry class. We’ll have an overview of how to learn carpentry, tool choices, ergonomic use and maintenance. Whether you are building a bird house, bathroom shelves, a bike shed or a log cabin, the right tools make all the difference. Practice making cuts; using levels, speedy squares and other tools; fastening boards; and working together getting your hands, mind, and bodies on projects around the land. Go to the next level with group projects and improve your understanding of simple building design. Design and start your personal project. Build your own simple project to take home! We ask students to decide what they want to make before the class so that we can have materials waiting on-site. You can make your very own rustic and simple shelf, bed-frame or other simple project. Materials for these projects will be offered to students at-cost. Because Sunday is a personal project day, so students are done with class when they finish their projects. Typically they finish sometime between noon and 3:30pm. We close up shop at 4:00, so everyone must be done by then (class ends Thursday- Saturday at 6:00pm). 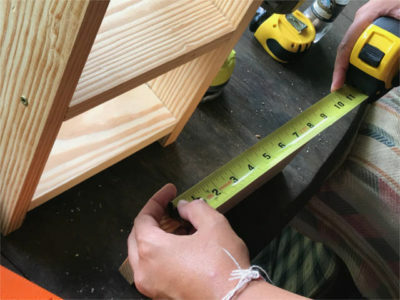 If you have time constraints, you can make it more likely to leave on the early side by choosing a simple project like making sawhorses or a small bookshelf.